Logans learnings, lessons, and leisure : Logans Lesson #1: Know your knives. Logans Lesson #1: Know your knives. About a two years ago I fell down a pretty big rabbit hole that I didn't really expect. I started looking for a good fixed blade camping knife (I am a firm believer that every camper should have a good knife on them). And I discovered that there was a LOT more to learn about knives than I originally thought. Because of my personality type before I can make any sort of purchase I have to at least understand enough about the thing that I am purchasing to be able to make an informed decision. That particular trait of my personality has been very beneficial for me, but it sometimes means that I take a long time before I make a move. This post is made up of some of the different things that I learned while researching that I thought would be beneficial for everyone to know so that they can feel educated as well. Believe it or not, all knives are not created equal, and whats more, all knives are not even created for the same purpose. This is a pretty basic rundown of the general types knives that are out there, some of the basic things that I feel like everyone should know. The end goal of this post is to help people understand how their knives are to be used, and how to know what to look for when they are choosing a knife for a specific job. There are three main categories of things that I'm going to describe. The Anatomy of the knife, the different general designs (patterns/styles), and then the "grind". Each category will help you understand the next. Also, this isn't specific to either fixed blade, or folding blade knives. It is instead pretty generic, and that is on purpose. The first thing to know about a knife is what to call all of the various parts of the knife are called. The "anatomy" of the knife as it were. The large bowie knife above is a Becker BK9. The Swiss Army knife is the Farmer model. Point: The point of the knife is one that basically everyone already knows about. It is self explanatory, and may also be called the "tip". The tip of the knife is not usually used for much at all, with the exception of drilling, but that is something that isn't really recommended, or even frequently used. that don't know) is one where you slice without sawing while drawing the knife towards you. Knives with large bellies are then more frequently used for tasks that involve slicing. thing). Surprisingly, the spine of the knife can be useful for things. things. Some knives have pommels that allow it to be used as a glass breaker, a hammer, a bottle opener, or a variety of other things. Face: The face of the knife. The side of the knife blade when viewed from the side. Tang: The Tang of the knife is something that is usually talked about on fixed blade knives, although some folders have them as well. The tang then is the part of the steel of the knife that is not part of the blade, and is what the handle is mounted to. The strongest fixed blade knives have full width, and full length tangs. You can see the exposed tang of the bottom knife. Many knives with full tangs will have parts of them cut out to make them lighter. Another word you might see thrown around is "Choil". That is not a misspelling of coil (as I thought for a while), and yes it is pronounced just like it is spelled "CH" + "oil". This describes a gap between the knife blade, and the base of the handle. A choil is usually a half circle cutout at the base of the knife, and its purpose is to allow you to sharpen the knife all the way back to the base of the handle. Without a choil, it can be very difficult to sharpen the part of the knife directly touching the base. Choils can also be made larger, and can be make large enough to fit someones finger, and can be used to allow the users hand to get closer to the edge of the knife. Next up we have the basic designs of the knife. Now, I say this VERY generally, as there are almost as many designs of knives out there are there are different personality types. However, many many knives fit into one of these design categories. Drop point. Now, remembering that the point of the knife is the ... point... this one should be pretty easy to understand. The point of a drop point knife is set somewhere below the level of the spine (when viewed from above the spine). This is probably the most common design out there, and it has been for a while. In this side view of a Becker BK2, you can see how the point of the knife is dropped below the spine. It is a good example of a drop point knife. Also just barely visible is a small choil right at the base of the blade. Clip point. This is very similar to a drop point, but with the drop point from spine to tip "clipped". This design tends to have very slender tips. These slender tips are excellent for stabbing, and anything that calls for a small tip. Perhaps the most famous version of the clip point is basically any variation of the bowie knife. Most combat knives are also clip points, and so are some hunting knives. Notice how the spine of the knife is flat until it gets "clipped" at an angle, and how it makes a very pointy point. The knife below is the Johnson Adventure Blades Baconmaker, an aptly named hog hunting knife. Trailing point. This design has a point that actually sits above the top of the spine when viewed from the top. That is, the point of the knife "trails" behind the spine of the knife. Trailing point knives generally have large bellies. The most common types of trailing points that you usually will see are steak knives. Now, not all steak knives are like this, but a good portion of them are. Given that knives with large bellies are great slicers, this makes sense. This is the Becker BK5. Notice how the tip of the knife is slightly elevated in comparison to the spine, and how that makes the belly of the knife even larger. Also notice the enlarged choil right at the base of the blade and before the handle. The grind of the knife is the last piece of the puzzle. The grind can make or break the knife. There are a few main types of grinds as well. Just keep in mind that this is in no way comprehensive. This image here shows many of the main grinds. They call the middle grind "high flat", although it is what I have typically seen called "sabre" grind, so that is what I will describe it as below. Scandinavian grind. This is the simplest kind of grind out there. Somewhere on the face of the knife (usually below the centerline), the blade is ground to a point with just one grind on each side which brings it to the final edge. The name is because knives from scandinavia usually feature this type of grind. The most common brand you see with this grind is called "mora", and they're a heck of a deal. I picked my mora up for $8 on amazon, and its an excellent knife. Here is a mora with a Scandinavian grind. Notice how low on the face of the knife the grind starts, and how there is no secondary edge. Sabre grind. A sabre grind can be vaguely similar to a Scandinavian (scandi) grind. 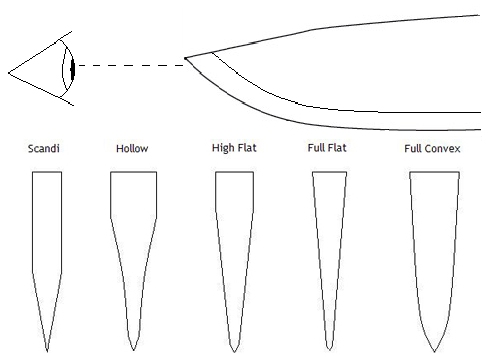 On a sabre ground knife, the thickness at the spine is left untouched for some amount of side (face) of the knife, before the "primary" (the one that shapes the knifes profile) grind starts. The primary grind (on any knife) then tapers down to "almost" the edge, where the secondary grind (the edge) starts. Sabre ground knives therefore have lots of material behind the edge of the knife. Sabre ground knives therefore are usually a bit heavier, and their primary grind angles are a bit more obtuse than a knife with a full flat grind. Because of this, sabre grinds are usually seen on "stronger" knives designed for rougher tasks like chopping, batoning, prying or something like that. Full flat grind. This one is simple after hearing about the other grinds. The primary grind starts exactly at the thickness of the spine, right at the spine, and tapers down exactly to the small secondary grind. In other words, the profile of this grind is a simple triangle, if viewed from the tip of the knife. Full flat grinds have a more acute primary grind angle than a sabre ground knife of the same blade height and thickness, and are therefore very commonly found in knives designed for slicing. In this photo you can see a full flat grind (bottom knife, with green/yellow handles) next to a sabre ground knife (on top, in black). 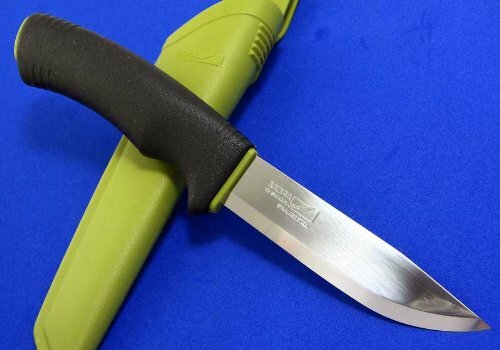 The full flat ground knife has a drop point, while the sabre ground knife has a clip point. 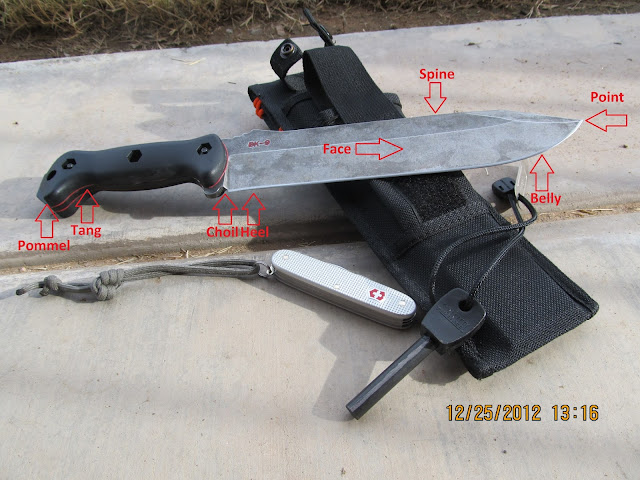 It is easy to see where the primary grind of the sabre ground knife starts and is easy to see about 2/3 - 3/4 of the way up the face of the knife. Hollow grind. This one is more rarely seen, as it is a bit more specialized. A hollow grind is what you would have if you took a full flat grind, and made the face of the knife (the primary grind) concave, rather than flat. What this does is make the angle of the primary grind behind the edge very acute. This style of knife is almost never designed to cut THROUGH things (think cutting strips of cardboard where the whole face of the knife is buried), but rather to cut "into" things. The easiest example of a hollow ground knife is a straight razor. They want the edge to be super thin, and the "media" they are cutting isn't thick or long, they can make a much thinner edge with a hollow grind than they could with any other kind of grind. Here is a hollow ground straight razor. Notice how deeply concave the face of the knife is. This makes the knife VERY sharp, but not very good for slicing through media (think cardboard). Convex grind. This is the last one I'll talk about. It is pretty easy to understand, and fairly commonly seen. Take your normal full flat grind, and then instead of taking away material from the side like you do with a hollow ground knife, you "add it back in" (visually, not how its made though of course) to make it convex, instead of concave. What this does for the knife is it gives it more of a teardrop shape, and it retains a good amount of material behind the edge of the knife, so it is a very strong design. Notice how the blade profile has no actual straight grind, it is instead one continuous curve. This image is courtesy of the backyardbushman. So there you have it. If you read through this and actually understood most of it (if not, try it again :)), then you should be actually pretty well educated on knifes compared to most people out there. With this knowledge, you can now look at almost any knife, and see from its design what it is probably used for. You should know that if you're wanting a good steak knife, it should probably have a nice large belly, and probably a full flat grind and probably be pretty thin (traits of good slicing knives). If you're looking for a chefs knife, you're probably wanting something similar. If you're hunting or camping, you will probably be looking for a drop point knife with a full flat or perhaps sabre grind. Those looking for combat knives will likely want something with a clip point, while "camping" knives (larger wood processing knives) are more frequently seen with sabre or convex grinds because of the abusive tasks that they are asked to do. This is the basics, and I've learned a bit more. But this is about as short as I could make this post and still make it be understandable. Perhaps in the future I will do a bit more in depth post on the more obscure knife patterns or designs.